Investigates the structure, function, and regulation of the bacterial transcription machinery. RNA, the blueprint for proteins, is made by a complex molecular machine, the DNA-dependent RNA polymerase, present in all cells. 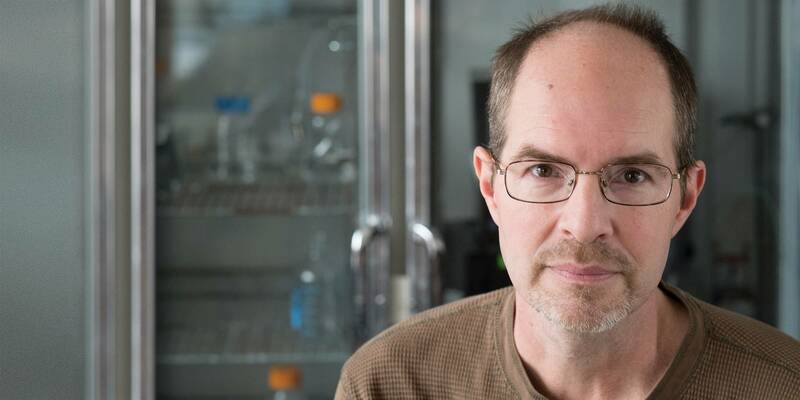 Using bacteria as a model organism, Darst’s research explores the mechanism and regulation of transcription by determining three-dimensional structures of RNA polymerase and associated proteins. This work has implications for understanding how gene expression is controlled in many organisms. In all cellular organisms, RNA is synthesized by a complex molecular machine, the DNA-dependent RNA polymerase (RNAP). In its simplest bacterial form, this enzyme comprises four subunits with a total molecular mass of approximately 400 kDa. The Darst lab focuses on highly characterized prokaryotic RNAPs, which share their basic structure and catalytic function with more complex archaeal and eukaryotic enzymes but are controlled by a much simpler set of regulatory factors. The basic elements of the transcription cycle—initiation, elongation, and termination—were elucidated through the study of prokaryotes. The RNAP catalytic core combines with initiation factors (called σ factors in bacteria) to generate a holoenzyme. It locates promoter sequences within the duplex DNA, forms the open promoter complex (RPo) by unwinding the DNA surrounding the transcription start site, initiates the synthesis of an RNA chain, and elongates the RNA processively in an elongation complex (TEC) while translocating itself and the transcription bubble along the DNA template. Then, finally, it releases itself and the completed transcript from the DNA when termination signals are encountered. The Darst lab used x-ray crystallography and cryo-electron microscopy to determine the structure of all stable RNAP complexes that mark the transcription cycle (the RNAP core enzyme, holoenzyme, open promoter complex, and elongation complex). These complexes interconvert through transient intermediates involving large conformational changes in the nucleic acids, RNAP, or both. At every stage of the transcription cycle, RNAP function is modulated by interactions with extrinsic regulatory factors. Even in “simple” bacteria, more than 100 RNAP regulators have been identified. Moreover, bacteriophage have evolved extrinsic factors that use ingenious mechanisms to subvert the host transcription process for their own purposes. Darst and his colleagues are seeking a detailed structural and functional understanding of the entire transcription cycle—knowledge that will be essential to explain the fundamental control of gene expression and to target RNAP with small-molecule antibiotics. Moreover, a complete understanding of how the cycle is driven by a complex molecular machine that uses binding and chemical energy to effect conformational changes—and it is modulated by regulators—is of fundamental interest. The researchers are using a combination of x-ray crystallography, cryo-electron microscopy, and other biophysical and biochemical approaches to fill the gaps in our understanding of the bacterial transcription cycle, particularly with regard to the large regulatory complexes and unstable transition states between the cycle’s stable states. A related research program in the laboratory, led by senior research associate Elizabeth A. Campbell, seeks to understand the transcription cycle of the human pathogen Mycobacterium tuberculosis to aid in the development of new antibiotics. Darst is a faculty member in the David Rockefeller Graduate Program, the Tri-Institutional M.D.-Ph.D. Program, and the Tri-Institutional Ph.D. Program in Chemical Biology. Chen, J. et al. 6S RNA mimics B-form DNA to regulate Escherichia coli RNA polymerase. Mol. Cell 68, 388–397 (2017). Kang, J.Y. et al. Structural basis of transcription arrest by coliphage HK022 Nun in an Escherichia coli RNA polymerase elongation complex. Elife 6, e25478 (2017). Campbell, E.A. et al. Crystal structure of Aquifex aeolicus σN bound to promoter DNA and the structure of σN-holoenzyme. Proc. Natl. Acad. Sci. U.S.A. 114, e1805–e1814 (2017). Bae, B. et al. Structure of a bacterial RNA polymerase holoenzyme open promoter complex. Elife 4, e08504 (2015). Researchers have uncovered new details about the molecular machine that separates DNA strands before copying a gene's sequence into RNA.